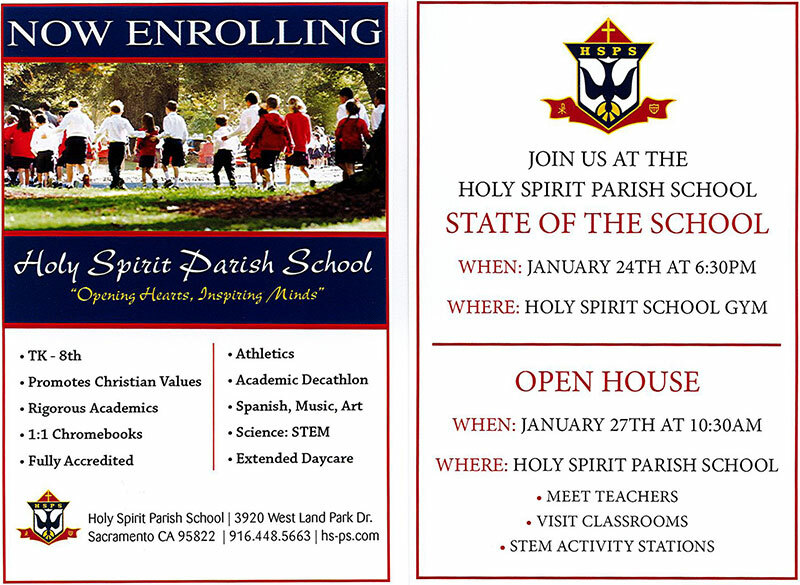 Holy Spirit Parish School is a Catholic community which recognizes the dignity of all its members and bases its philosophy on the educational mission set forth in to teach as Jesus did. The school provides students in grades kindergarten through eight with a diverse, well-rounded curriculum, modeled by the teaching of Jesus through the values, traditions, philosophies and practices of the Roman Catholic Church. Holy Spirit Parish School, established in 1947 as an educational ministry of Holy Spirit Parish, was administered by the Sisters of Mercy until 1999. The school provides students in grades Transitional kindergarten through eight with a diverse, well-rounded curriculum, modeled by the teachings of Jesus through the values, traditions, philosophies and practices of the Roman Catholic Church. The school cultivates academic excellence, lifelong learning, and Christ-like leadership with a passion for peace, justice and service. Its curriculum provides spiritual, intellectual, physical, moral and emotional growth in a liturgically rich environment.